Choose from 28 hotels and guest houses in Lanarkshire. Shown below a just a selection of the hotels available. To search within an area please use the menu on the right. Premier Inn Glasgow East Kilbride Central - Glasgow East Kilbride Central Premier Inn is conveniently located for East Kilbride Train Station. 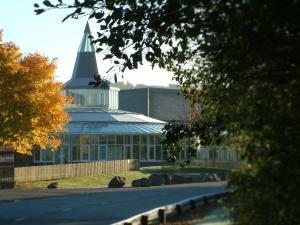 It is also near to Enterprise Business Park, Calderglen Country Park and a cinema and ice rink. The hotel offers the expected Premier Inn facilities including an on-site Beefeater restaurant, comfortable beds and free guest parking. Some rooms at Premier Inn can take 2 adults and up to 2 children (under 16 years). The 2 children also get a free full breakfast when accompanied by an adult eating a full breakfast. The full all-you-can-eat breakfast has the expected cooked items, including vegetarian sausages, as well as a wide continental selection. Premier Inn Glasgow (Motherwell) - With close links to the M8, Premier Inn Glasgow (Motherwell) is located between the city centres of Glasgow and Edinburgh and has a Table Table restaurant and free car park. 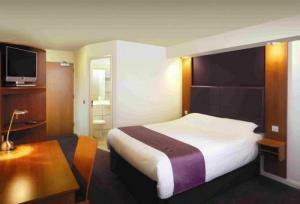 Some of the comfy rooms at Premier Inn can take 2 adults and up to 2 children (under 16 years). The 2 children also get a free full breakfast when accompanied by an adult eating a full breakfast. The full all-you-can-eat breakfast has the expected cooked items, including vegetarian sausages, as well as a wide continental selection. Premier Inn Glasgow East Kilbride (Peel Park) - About 1.5 miles (2.4 km) from East Kilbride Train Station, this Premier Inn with on-site carvery and pub is south of Glasgow, near to Peel Park and Milton Industrial Estate. 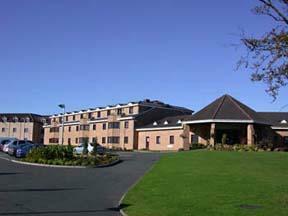 Premier Inn Glasgow East Kilbride (Peel Park) is ideal for business and leisure guests. 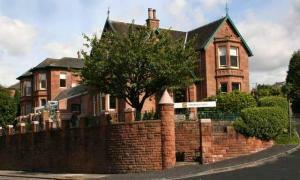 It is 1 mile from East Kilbride town centre, and a shopping centre, cinema and ice rink are nearby. Some rooms at Premier Inn can take 2 adults and up to 2 children (under 16 years). The 2 children also get a free full breakfast when accompanied by an adult eating a full breakfast. The full all-you-can-eat breakfast has the expected cooked items, including vegetarian sausages, as well as a wide continental selection. Moorings Hotel - Sitting proudly in a wonderful elevated location, this family-run Scottish hotel is situated in an area of natural beauty, with a country park directly on its doorstep. Enjoy a relaxing experience in comfortable surroundings within easy reach of such main attractions as Lanark New Town, Strathclyde Country Park, Loch Lomond, Burns Country, Stirling, Edinburgh, Highland Perthshire, The Borders and Glasgow. The hotel is also a great comfort stop on the way north from England and the south. For businessman, the hotel offers excellent conference, meeting and seminar facilities and close proximity to the main M74 and M8 Scottish motorway arteries in Lanarkshire, Central Scotland. Come and spend some time here to find out why the hotel has such a growing reputation among both leisure and business visitors to Scotland. Holiday Inn Glasgow - East Kilbride - This modern hotel with air-conditioned rooms, a leisure club and Wi-Fi access is 7 miles (11.3 km) from Glasgow city centre and easily reached from the motorway network. Triangle Health & Fitness Club has a swimming pool, spa, sauna, steam room, fitness suite, beauty salon and cr?che. Holiday Inn Glasgow - East Kilbride also has a bar and restaurant. The hotel is 3 miles (4.8 km) from Hampden Park, and within 10 miles (16 km) you will find M&Ds Theme Park, Calderglen Country Park, Kittochside Museum of Country Life and a shopping centre. Conference and banqueting facilities are available. Premier Inn Glasgow (Bellshill) - Premier Inn Glasgow (Bellshill) is east of Glasgow and close to the M74 and M73 motorways. It has free car parking and a Brewers Fayre restaurant on site. Some comfy rooms at Premier Inn can take 2 adults and up to 2 children (under 16 years). The 2 children also get a free full breakfast when accompanied by an adult eating a full breakfast. The full all-you-can-eat breakfast has the expected cooked items, including vegetarian sausages, as well as a wide continental selection. Hilton Strathclyde - Set between bustling Glasgow and Edinburgh, the Hilton Strathclyde hotel boasts excellent facilities including Scotland's largest hotel health club. Do business in one of 6 meeting rooms for 2-400, or wind down in the restaurant, bar or caf? with wireless internet access. Try out the swimming pool, gym, jacuzzi, sauna and fitness studio. The Popinjay Hotel and Spa - Popinjay Hotel is located in private gardens that reach down to the banks of the River Clyde, in the heart of the Famous Clyde Valley. The hotel has a modern leisure centre with an 18-metre swimming pool, a gym, spa and sauna. It also has fishing rights for the river. Popinjay Hotel is 4 miles (6.4 km) from the M74 and local attractions include Strathclyde Park, Bothwell Castle and Glasgow Cathedral. Built in the Tudor fashion and containing en suite rooms, Popinjay Hotel takes its name from an imaginary bird connected with local May Day celebrations from the 17th century. Following new owners, Popinjay has renovated public areas. Both ground-floor bedrooms have been renovated to disabled status. Best Western Strathaven Hotel - The hotel is on the edge of the picturesque market town of Strathaven and is ideally located for business or leisure. A family run hotel, built by Robert Adam Jnr in the 18th century and set in three acres of grounds. We are centrally located and are within a 40 minute drive from either Glasgow or Prestwick Airports. The award-winning restaurant, recently refurbished, has the option of the Table d'H?te or Grill Menu, or you can enjoy a Bar Meal from our extensive menu in the East Lounge. The Strathaven Hotel is privately owned and managed by the MacIntyre family. The main building dates back to 1797 and was originally built for a Glasgow Merchant. It was designed by the famous Robert Adam, still retaining many original features and is a Category B listed building. The Strathaven Suite is the ideal setting for weddings, conferences and formal or informal dinner parties for up to 180 guests. The picturesque grounds are very colourful and make a delightful backdrop for wedding photographs. Alona Hotel - On the banks of the loch in the grounds of the idyllic Strathclyde Country Park, Alona Hotel has a laidback atmosphere and a lovely restaurant. 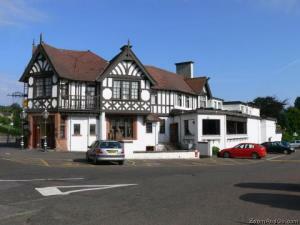 Located in Motherwell, southeast of Glasgow, Alona Hotel is close to the M74 motorway. The Glasshouse Restaurant, with its bright, airy decor and relaxed atmosphere, offers modern Scottish dishes created from local produce. Full Scottish breakfast is served each morning. The bedroom facilities include blackout drapes, a flat-screen TV and free Wi-Fi access. Best Western Eglinton Arms Hotel - In the village of Eaglesham, 4 miles (6.5 km) from East Kilbride and 10 miles (16 km) from Glasgow, this 18th-century coaching inn offers bright, airy en suite rooms. With a traditional bar and a good-quality restaurant offering fresh food, the Best Western Eglinton Arms Hotel has historic original charm and traditional character. There are 35 comfortable en suite rooms, all of which have a bath and/or power shower. Many have views of an historic local park (the Orry). Free wireless internet access is available throughout With direct access to the M77 and M8 motorways, the hotel is just 30 minutes from Glasgow International and Prestwick airports. Free on-site parking is available. Express By Holiday Inn Strathclyde Park M74, Jct 5 - With ample free car parking and a complimentary continental breakfast, this hotel is ideally located for Hamilton and Motherwell, and just 8 miles from Glasgow and 38 miles from Edinburgh. The hotel is ideal for both business and leisure travellers. Located on junction 5 just off the M74, the hotel has easy access to motorway links. Evening meals are available, and the hotel has a bar/lounge available to residents from 11:00 to 03:00 daily. The hotel is within easy access of Strathclyde Business Park and Motherwell Food Park. Hamilton and Motherwell are within 5 minutes' drive of the hotel. Glasgow Airport is a 35 minute drive and Edinburgh Airport is a 45 minute drive away. Premier Inn Glasgow East - With great motorway links, Glasgow East Premier Inn is 7 miles (11.3 km) from from the city centre, and close to train stations with services to Glasgow Central Station. This Premier Inn has the facilities you would expect: free parking, an on-site Beefeater restaurant and very comfy beds in each room. Local attractions include the River Medina and historic Osborne House. The M74, M8 and M73 are easy to access. Some rooms at Premier Inn can take 2 adults and up to 2 children (under 16 years). The 2 children also get a free full breakfast when accompanied by an adult eating a full breakfast. The full all-you-can-eat breakfast has the expected cooked items, including vegetarian sausages, as well as a wide continental selection. Tinto House Hotel - In 5 acres of beautiful, peaceful grounds, at the foot of Tinto Hill in the stunning Scottish Borders, the Tinto House Hotel was established in 1914 and fully refurbished in the late spring of 2009. Surrounded by the breathtaking scenery of the Upper Clyde Valley, the Tinto House Hotel is great for a relaxing break. Just 45 minutes from both Glasgow and Edinburgh, you can enjoy the cities' many attractions and lively nightlife with the hotel as a comfortable and relaxing base. The historic market town of Biggar is just 3.5 miles (5.6 km) away and other attractions nearby include the Falkirk Wheel, the World Heritage Site at New Lanark and Roslin Chapel. All of the en suite rooms have tea/coffee, irons, hairdryers and telephones. The contemporary restaurant serves a wide variety of modern and traditional dishes. The friendly staff are always on hand to offer a warm welcome and provide exceptional service. Premier Inn Glasgow East Kilbride Nerston - This Premier Inn is 1 mile from the town centre and convenient for East Kilbride Train Station and the M74. 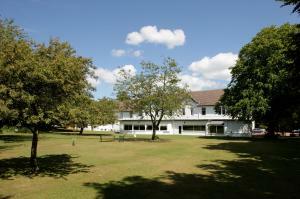 Local attractions include Tatton Park and Mere Golf and Country Club. Glasgow East Kilbride Nerston Premier Inn has a Table Table restaurant on site, as well as free parking and rooms with extremely comfy beds. Some rooms at Premier Inn can take 2 adults and up to 2 children (under 16 years). The 2 children also get a free full breakfast when accompanied by an adult eating a full breakfast. The full all-you-can-eat breakfast has the expected cooked items, including vegetarian sausages, as well as a wide continental selection. The Bruce Hotel - The Bruce Hotel is situated in the centre of East Kilbride making it the ideal place to stay for business or pleasure, easily accessible by motorways from the North and South and only 40 minutes drive from both Glasgow and Edinburgh Airports. Convenient, whether you're coming by train or plane. For guests driving, there is ample space in our underground car park. Glasgow City Centre, and its renowned cultural delights, is a short drive away. Roam a little further and you can soon be on the bonnie banks of Loch Lomond. Our 65 en suite bedrooms, many of which have been recently refurbished to a very high standard, enhance the theme of elegant comfort, which continues through the award-winning Four Seasons Restaurant, the Bistro and Cocktail bar. Premier Inn Glasgow (Cumbernauld) - Near the A80, M73 and M80, this Premier Inn is 13 miles (20.9 km) northeast of Glasgow city centre, and offers an on-site Beefeater restaurant, comfy beds and free parking. Local attractions include Kingholm rugby ground and Oxstalles tennis centre. Some rooms at Premier Inn Glasgow (Cumbernauld) can take 2 adults and up to 2 children (under 16 years). The 2 children also get a free full breakfast when accompanied by an adult eating a full breakfast. The full all-you-can-eat breakfast has the expected cooked items, including vegetarian sausages, as well as a wide continental selection. Glenskirlie House And Castle - In lush, landscaped grounds, in the heart of central Scotland, this luxurious 4-star hotel boasts an award-winning restaurant, free Wi-Fi and stylish, individually designed boutique rooms. In a beautiful, peaceful location near Stirling, Glenskirlie House and Castle is only a 20-minute drive from Glasgow and a 40-minute drive from Edinburgh. Glenskirlie House was established in 1982 as a small, family-run restaurant with an emphasis on quality food and first-class service. In 2007, Scotland's first newly built castle of the 21st century opened, extending the facilities and offering luxurious hotel accommodation. Each of the rooms is individually designed with its own unique charm. Stylish, luxurious and elegant, the rooms combine traditional charm with modern design and contemporary comforts, including flat-screen TVs and DVD players. Today, the long-established Glenskirlie House restaurant offers award-winning fine dining, while the new Castle Grill is more relaxed and informal, offering delicious fajitas and freshly grilled steaks. Old Mill Hotel - Old converted Grain Mill overlooking the river and waterfall in Motherwell. 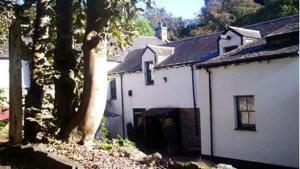 The Old Mill has a restaurant and function suite overlooking the Falls of Calder. Ideal for both business and pleasure offering accommodation, restaurant and function suite ideal for weddings (approx 140). Enjoy our beautiful secluded garden and river walks. Lunchtime meals are also available. Holiday Inn Express, Hamilton - Offering modern accommodation, the Holiday Inn Express, Hamilton has been created for value and comfort, whilst offering free Wi-Fi in public areas. Opened in May 2007 and rebranded in 2009 to the new Holiday Inn Express style, the hotel has 104 bedrooms and 3 meeting rooms. With a prime position in Hamilton town centre, the hotel is ideally located within a 2-minute drive of the M74. There is a buffet breakfast where you can eat as much or as little as you like from the wide selection. In the evenings, relax in the Great Room Bar. At the Holiday Inn Express Hamilton, staff aim to make your stay a pleasant and enjoyable experience. The hotel prides itself on its vibrant, friendly approach; you are made to feel at home as soon as you arrive. Days Inn Hotel Abington (Glasgow) - Located directly off junction 13 of the M74, Days Inn Abington is in the Upper Clyde Valley of the Southern Uplands, within easy reach Glasgow and Edinburgh. All rooms are spacious, en suite and have tea/coffee making facilities, a free newspaper, remote control TV and free parking. Most have views of the beautiful countryside. Reception is open 24 hours a day. The adjacent Welcome Break service area has a self-service restaurant, retail outlet and coffee shop. The Coachman Hotel - In the heart of the charming town of Kilsyth, this modern inn is surrounded by wonderful views of the surrounding Lanarkshire countryside and the Campsie Fells. The Coachman Hotel has 11 en suite rooms, all of which have TVs, telephones and tea/coffee making facilities. Each comfortable and inviting room has been tastefully furnished to reflect the inn's countryside setting, with wooden floors and furnishings as well as inviting, crisp white bed linen. Warm and welcoming, the bar is at once classic and yet contemporary. Furnished and decorated in rich woods, the bar offers friendly service and a wide range of real ales, bottled lagers, wine and spirits, including, of course, Scotch whisky. The restaurant offers tasty food made with locally sourced, fresh seasonal produce. Free wireless internet access is available in the public areas and free private parking is available on site. The Westerwood Hotel and Golf Resort - QHotels - The Westerwood is situated in 400 acres, nestling at the foot of the Campsie Hills, conveniently located midway between Glasgow and Edinburgh. A warm welcome awaits you at this hotel, situated in the heart of Scotland. The Westerwood Hotel is ideal for business travellers due to its fabulous location between Glasgow and Edinburgh. The hotel is close to a major motorway and only a short distance from 3 international airports. The Westerwood offers a range of benefits: free and secure parking, quick and easy check-in, superbly appointed working areas in the bedrooms, 24-hour room service and free use of the health and leisure club. The hotel's own 18-hole golf course was designed by Seve Ballasteros and Dave Thomas. Premier Inn Glasgow (Hamilton) - Premier Inn Glasgow (Hamilton) is just off the M74, at the 24-hour motorway services by the River Clyde and Gourock Ferry Port, 10 miles (16 km) from Glasgow. The Premier Inn is within easy reach of the M8 and 1.5 miles from Hamilton town centre. It has a Roadchef restaurant and Costa coffee outlet, as well as free parking and very comfortable rooms. Some rooms at Premier Inn can take 2 adults and up to 2 children (under 16 years). The 2 children also get a free full breakfast when accompanied by an adult eating a full breakfast. The full all-you-can-eat breakfast has the expected cooked items, including vegetarian sausages, as well as a wide continental selection. Redstones Hotel - This newly refurbished, contemporary hotel with landscaped gardens is in the centre of Uddingston and within close proximity of local amenities. Redstones is a 2-minute walk from the local train station, which takes you straight into Glasgow and Edinburgh. It is a 2-minute drive from all main motorway links into Scotland's 2 main cities. Good service and a friendly welcome await you, and a wide range of fresh food is served from 07:00 until late, 7 days a week. Each room is individually designed with quality fixtures and fittings and a luxurious bathroom. Uplawmoor - Uplawmoor Hotel, set in the picturesque hills of Renfrewshire, near Glasgow. Uplawmoor Hotel & Restaurant is a small independent hotel, personally managed by Stuart & Emma Peacock who offer visitors to Scotland. Comfortable accommodation facilities, combined with traditional Scottish food, drink and a genuine friendly welcome. Located in the tranquil village of Uplawmoor, just 25 minutes drive from Glasgow City Centre and Airport, 15 minutes to Braehead Shopping Centre, close to the Ayrshire border and 30 minutes from Prestwick Airport. Our 14 well appointed bedrooms are all en-suite with showers and offer satellite TV, direct-dial telephone, tea/coffee making facilities and natural spring water. Included is a traditional Scottish Breakfast, cooked to order with freshly ground Coffee or Tea. Fresh natural produce is the key to the highly acclaimed cuisine at Uplawmoor. Our Restaurant has recently been awarded a 2nd AA Rosette, is recommended by the Taste of Scotland guide and were finalists in the Scottish Tourist Board prestigious Thistle Awards Natural Cooking of Scotland category. Therefore, you can be sure of our commitment to quality ingredients and fine food whether choosing from our imaginative A la Carte or seasonal Table d'hote menus in the restaurant, or taking a simpler meal in our relaxing Lounge Bar. During the summer, visitors can also enjoy the Beer Garden, leading into the village park. We pride ourselves on our friendly and personal service renowned in the local area. Shawlands Hotel - This family-owned hotel has recently undergone a multimillion-pound redevelopment and is conveniently situated just off junction 8 of the M74. 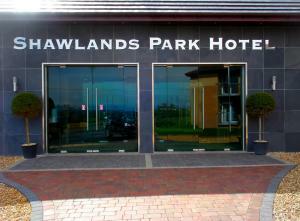 The Shawlands Hotel is situated on the A71, just 20 minutes from Glasgow and 40 minutes from Edinburgh. After its recent refurbishment, the hotel is now awaiting 4-star accreditation as south Lanarkshire's newest luxury hotel. Overlooking the beautiful Clyde Valley, the hotel offers a choice of 49 stylish and contemporary rooms, including standard and premier rooms, premier suites and premier family suites with balconies overlooking the peaceful countryside. There are 3 well-stocked bars, including the public bar and the main foyer bar. The Ash Grill Restaurant, Carvery and Grill offers the ultimate social and eating experience in beautifully elegant, modern surroundings. Abington Hotel - Less than a mile from junction 13 of the M74, this hotel is easy to find and features free Wi-Fi internet access throughout, and ample free parking. This friendly, family-run hotel is situated in the heart of a picturesque village in central Scotland and offers a comfortable, reasonably priced touring base. The centres of Edinburgh, Glasgow, Stirling and the Trossachs, Burns country and Walter Scott country are all about an hour's drive away. Had you travelled by stagecoach on the hazardous Carlisle-Glasgow route in the 1800s you would certainly have appreciated the hospitality and warmth of the Abington Coaching Inn, just as Napoleon III did in 1839 when he rested there after a tiring day's grouse shooting. You can still find his chair in the hotel.